Hello, friends! Happy December! I hope you're enjoying the start of the Christmas season with all of the festive sights, scents, and flavors. In our house, I've just about finished the Christmas decorating and am looking forward to enjoying the rest of the month. Our oldest will be home from college in a couple of weeks and our youngest will be out for the holidays as well. I plan to relish every moment since this will be our last year before our youngest goes off to college. 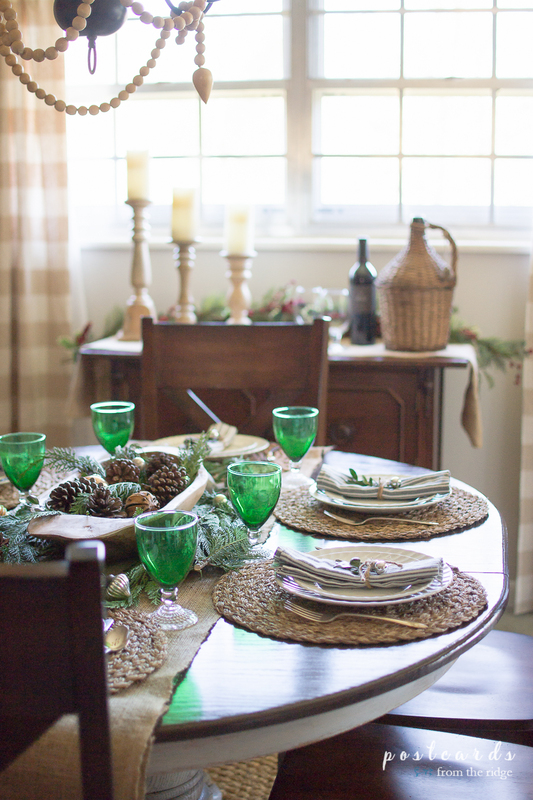 Anyway, today I'm sharing this year's Christmas tablescape. We don't have a dining room in this house so what you see is where we eat everyday. No, it won't stay exactly like this all month, but I do like to dress it up a little. Lately I've been drawn towards simple, natural elements and that's how the table is decorated. Here's how I set it all up. 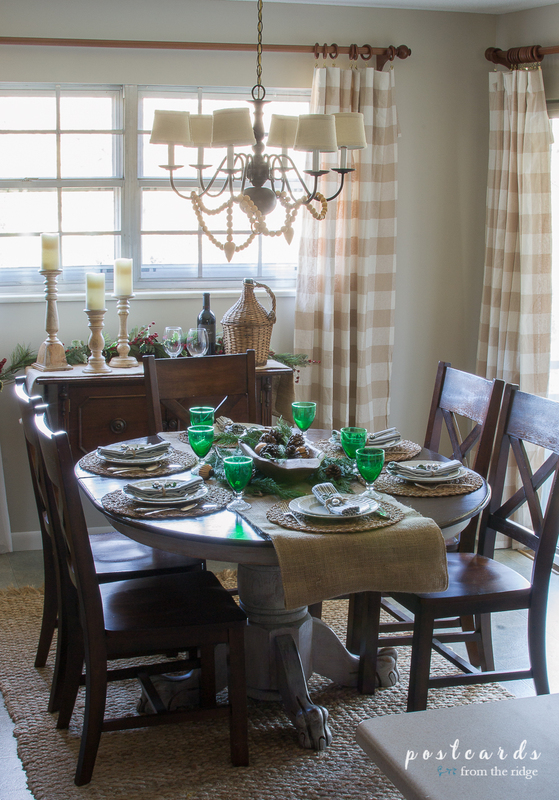 For this easy tablescape, I started with a basic burlap table runner. I added some laurel cypress, boxwood, pine cones, and a few more items to a wooden dough bowl for a very simple centerpiece. We're not at all fancy or formal so this suits us to a t. My youngest actually said it's too much. Obviously she's not used to having the table all decked out, lol. 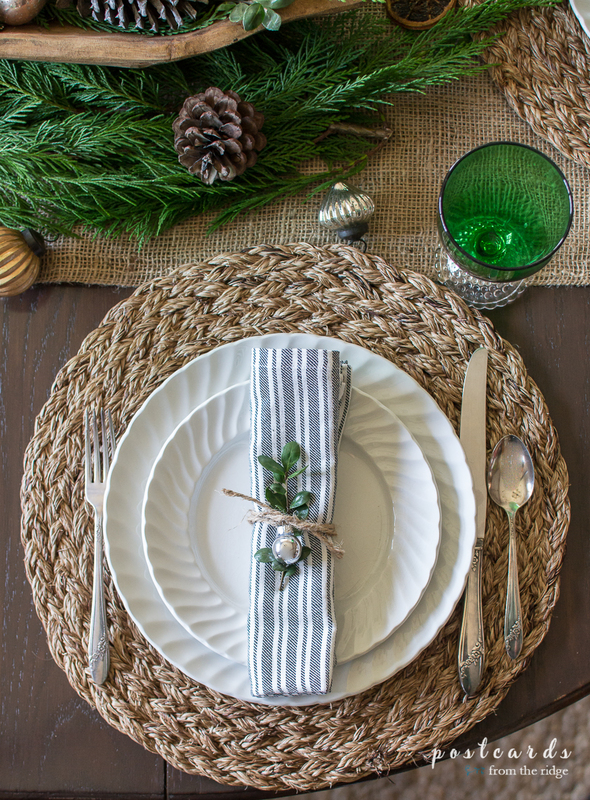 Some vintage white ironstone plates and vintage silver sit on our round woven placemats. 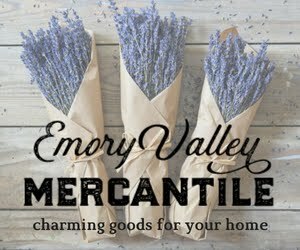 And I added some black striped napkins from my shop, Emory Valley Mercantile, tied with twine. 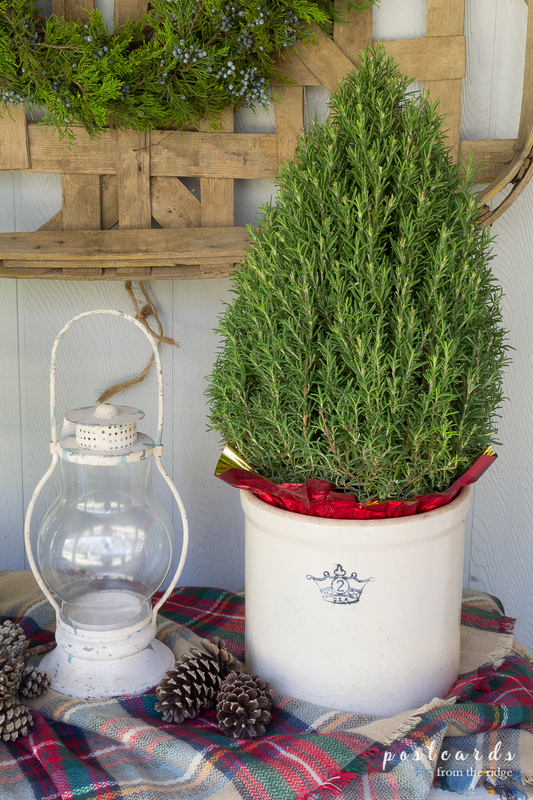 A little sprig of boxwood adds a bit more color to the setting. And a tiny silver ornament gives it just the slightest amount of bling. The vintage green goblets were favorites of my late mother-in-law so I like to use them when I can. They fit perfectly with the natural theme, even though they're a little fancier than the rest of the elements. And did you notice the chandelier? That's one of my favorite, most budget-friendly makeovers that I've ever done. It was shiny brass when I got it from a yard sale 10 years ago for less than $10. I spray painted it black and added some chandelier shades to update it. (Please don't judge me for the lopsided ones!) And this year I added the wood bead garland for a little more character. What do you think? I've actually NEVER shared a Christmas version of this mantel because it was red brick and my Christmas decor never looked good on it. A couple of months ago I did a paint technique on it (go HERE to see what I did) and now the Christmas decorations look great here. 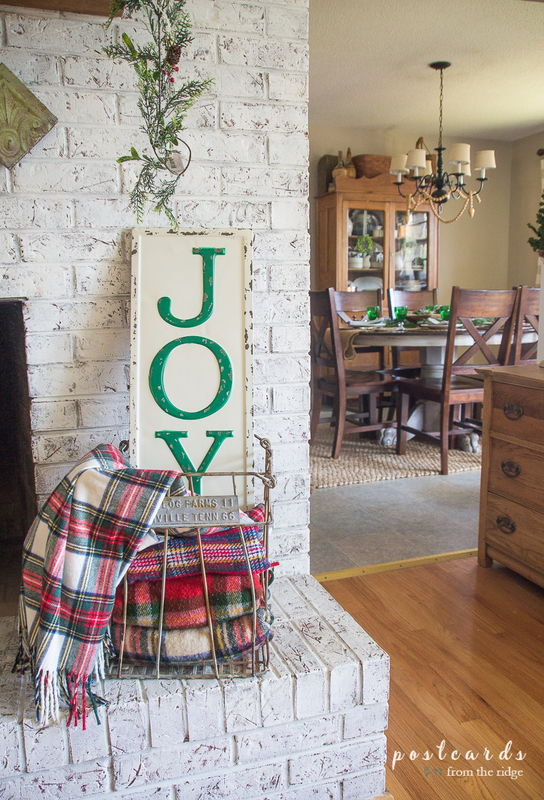 I've partnered with Joann Fabrics to give it a snowy Christmas look. Come back Tuesday to see it all, or join our subscriber list below and you'll have it sent to you automatically. I'll be touring with about 25 of your favorite farmhouse style bloggers for a huge Christmas tour. You won't want to miss it! Here are the sources for the area in case you see anything you would like to have for your own home. 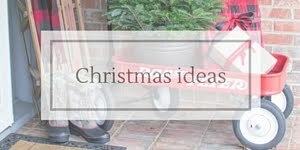 And for all of my Christmas decorating posts since 2011, go HERE. 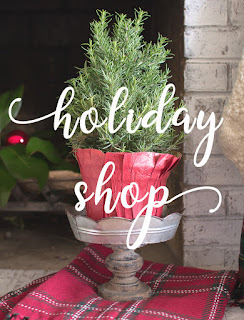 Visit my holiday shop with over 100 cozy Christmas items HERE. Angie, I love your tablescape! I hopped over to visit because I saw those green goblets on your table. My sister-in-law gifted me with a set last year and I just love them. 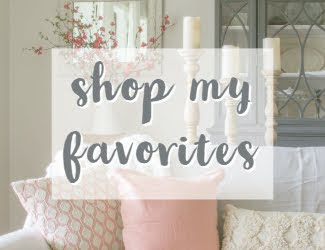 I clicked over to Etsy and saw lots of things I'm putting on my Christmas wish list! The different textures really added to the green color you used, beautiful enjoy your time with your girls. I love ALL of your tablescape! The natural woodland look is what I love for any time of year. Those green goblets are a perfect shot of color. The bricks look great painted too! Thank you AnnMarie!! I love the natural look year round as well. It's just so peaceful and calming to me. Your table looks beautiful! I love the natural elements and those green goblets are the icing on the cake. My eye immediately went to them. LOVE! Thanks Paula! You know I have to have something vintage on the table and those glasses were the perfect finishing touch! Amazing..! 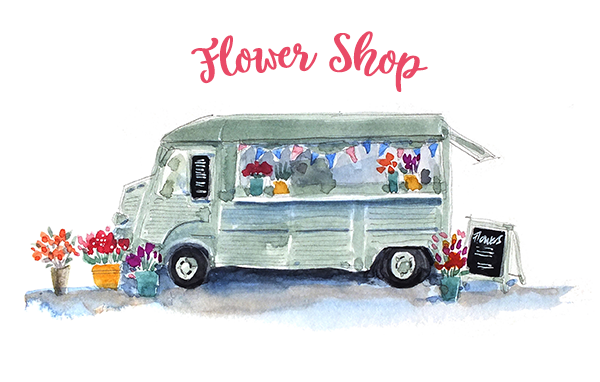 Lovely pictures and your idea..Thank you for sharing wonderful blog.. I saw this tablescape on instagram and loved it! 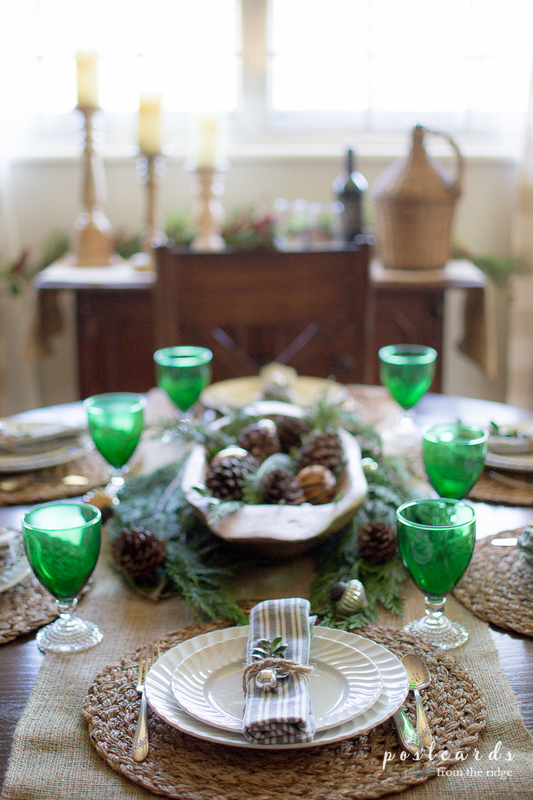 The green vintage goblets look so great with the neutral an fresh greenery. I am going to agree with some others here, I really like the green vintage goblets. They add a nice pop of color against all the neutral browns and tans in the scene plus anything vintage for a tabletop setting is good by me. This is just gorgeous, Angie. I love that you used your normal decor and added the seasonal accents. The textures and colors are beautiful. All the natural colors are so beautiful and the green glasses are perfect! Love it all! I love this so much...beautiful, peaceful. and elegant! I would feel very special being a guest at your table! Angie, what a lovely and natural table! I'd gladly sit down and share a cup of tea and chat about all your lovely home decor. Enjoy your holidays my friend. This is wonderful. 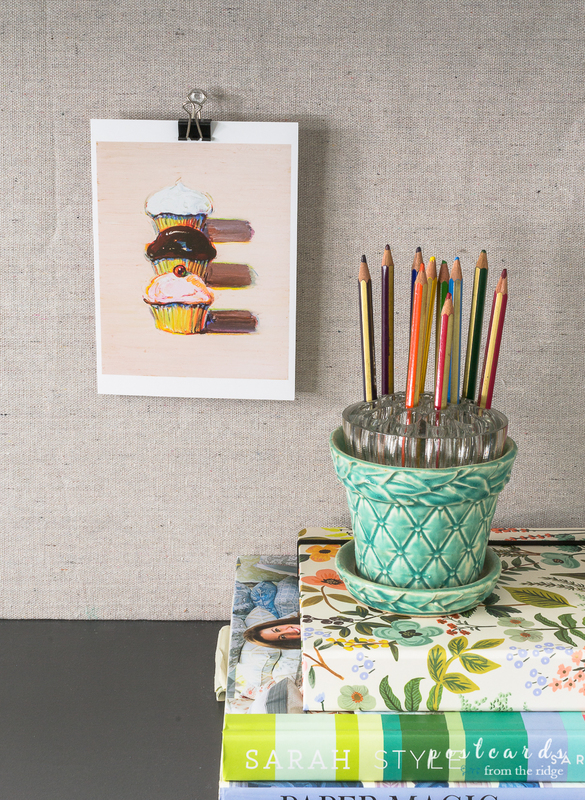 I love how you mixed in natural elements into your decor for truly elegant results. Angie, I always enjoy decorating with nature! So I love your tablescape. 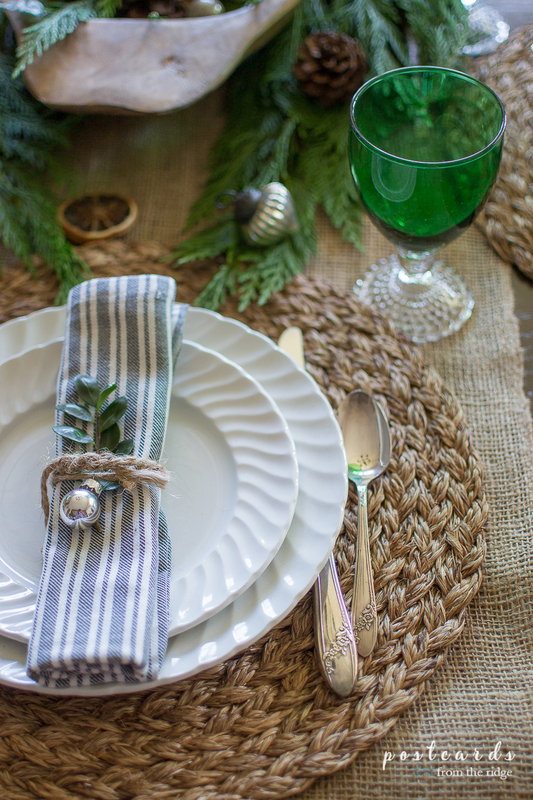 Everything works together beautifully from the green goblets on down to the woven placemats. Love the dough bowl too! Also love your chandy redo. Love how your background of vintage candlesticks sets everything up so nicely. Seems every time I want to take a photo I have a background that's MUCH less than perfect. Ha! 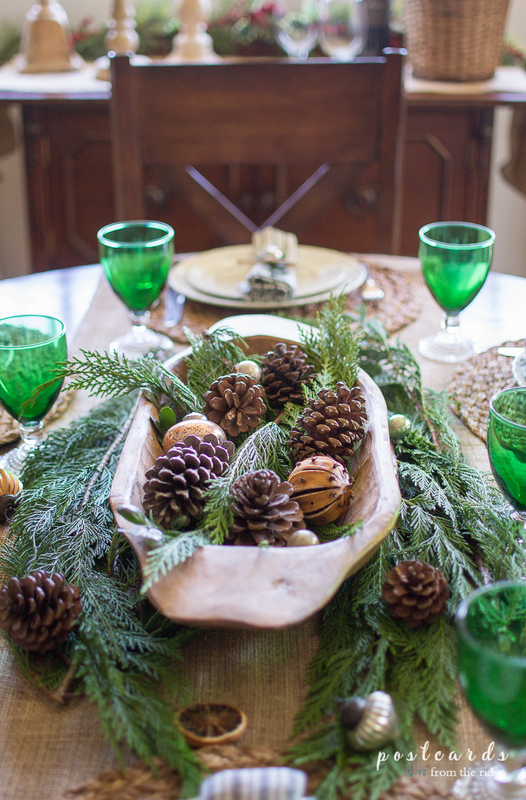 Hello Angie, your table is beautiful with all the greenery and pinecones ~ simple and elegant! I know your daughter said it looks like it's a lot, but with natural elements it seems perfect. <3 Happily pinning, G+ for you. Will stop back by to see your home tour on Tuesday.